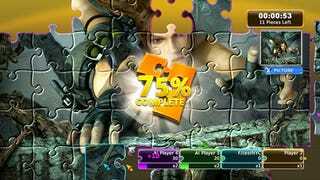 Eidos delivers all of the fun of jigsaw puzzles with none of the missing pieces this Christmas Eve with the announcement of Puzzle Arcade, an interactive jigsaw puzzle game for Xbox Live Arcade. Puzzle Arcade sounds like a lovely little family-friendly title to help ease new Xbox 360 owners into the live experience. The game features a wide variety of pre-made puzzles for players to put together in either slow-paced Classic mode or the timed Turbo mode. The game also contains a selection of fractal puzzles, which upon completion pan out to show you the image's place in a much bigger puzzle. Players can even use the Xbox Live Vision camera to create their own puzzles. Nothing says "Merry Christmas, love!" like a custom jigsaw of your naughtier bits. With co-op and head-to-head play over Xbox Live and the promise of downloadable puzzle packs in the future, Puzzle Arcade could very well be a nifty little title to help while away the holiday season. At the standard 800 MS points, I might very well snag a copy myself. And then the visual trauma begins. Monday 22nd December/... Eidos Interactive, creator of some of the world’s leading videogame properties, introduces PUZZLE ARCADE, an interactive jigsaw puzzle game coming to Xbox LIVE® Arcade for the Xbox 360® video game and entertainment system from Microsoft this Christmas. PUZZLE ARCADE delivers a fun-filled, finely-tuned jigsaw building engine making full use of the Xbox LIVE service and LIVE Vision camera, with head-to-head and co-op play, both over Xbox LIVE and on the console. Fully customisable, PUZZLE ARCADE boasts a variety of game modes and difficulty levels and has a gradual learning curve which reveals the depth and scope of potential game play available. There are multiplayer options, lots of achievements to unlock and also fractal puzzles - which when completed, reveal the finished image’s place within a much bigger picture - providing PUZZLE ARCADE with possibly some of the biggest online jigsaw puzzles ever created. PUZZLE ARCADE is available on Xbox LIVE Arcade from the 24th December.